BioZyme Inc., innovators in natural animal nutrition and microbiology, is now offering a nutrient-rich, liquid supplement for commercial swine and poultry called HydraBoost™. Offered through BioZyme’s new Imunabiotics™ brand for monogastrics, HydraBoost is a unique blend of vitamins A, D and E; prebiotics; B vitamins; sodium butyrate; electrolytes and gut health components known to combat the impacts of stress during any period of transition. HydraBoost is powered by natural feed additive AO-Biotics™ — BioZyme’s proprietary strain of Aspergillus oryzae fungus acquired through a unique, multistep fermentation process. AO-Biotics, acting as a prebiotic, is proven to maintain gut immunity in swine and poultry, therefore increasing overall health and rapidly restoring digestive balance during times of stress, such as weaning. Weaning imposes tremendous stress on piglets and is accompanied by marked changes in gastrointestinal physiology, microbiology and immunology. The post-weaning decrease in absorptive capacity in weaned pigs, coupled with immature digestion, often lead to nutrient indigestion and intestinal upsets causing diarrhea, depression of growth and even death. Maintaining proper gut health immediately post weaning has value by reducing the economic losses in production associated with infections via mucosal surfaces. A healthy gut is essential for the efficient conversion of feed into its basic components for optimal nutrition absorption. If gut health is compromised, digestion and nutrient absorption will be affected, and bird performance and welfare will be compromised. The gut consists of a diverse range of bacteria, fungi, protozoa and viruses and the development of the gut microbiota begins upon hatching, when bacteria are picked up from the environment, the feed and people. Maintaining gut health through good bird management practices is key to maintaining bird health, welfare and performance. 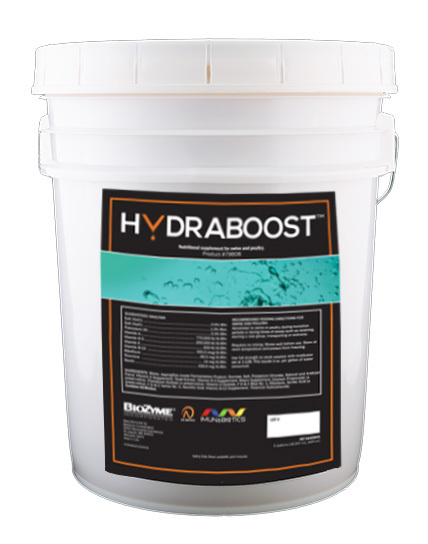 HydraBoost is ready to use, so there is no mixing. To use, simply put the medicator hose in the HydraBoost 5-gallon bucket and set the ratio to 1 oz. per gallon of drinking water (set medicator at 1:128). Use HydraBoost for seven days after receiving new baby broiler chicks. For weaning piglets, use HydraBoost for days 1 thru 7 post-weaning, up to 14 days post-weaning. Make sure pigs have easy access to water and that waterer height and pressure are correct. For more information about HydraBoost , visit www.imunabiotics.com or contact Bill Bayless at 618-708-8788 or bbayless@biozymeinc.com.